Acanthastus luniewskii. Plate from Kozłowski (1948). The five known species of Acanthastus were all described by Roman Kozłowski in his legendary 1949 monograph Les graptolithes et quelques nouveaux groupes d'animaux du Tremadoc de la Pologne which has done more than any other book to make me wish that I could read French. It was in this book that Kozłowski established the currently accepted relationship between the Palaeozoic graptolites and the recent pterobranchs (see this post here) based on his descriptions of early sessile graptolites from the early Ordovician of Poland. The Acanthastus remains were found in the same deposits, but establishing their affinities was just a little more difficult. Acanthastus was represented by small flattened circular chitinous fossils (up to a few millimetres across) with a central dorsal opening surrounded by a ring of upwards-pointing spines. This central opening was crossed by tubes connected to the spines with a central cavity underlying this opening. Beneath and around this central cavity were a number of further chambers, divided by internal walls from the central cavity. The dorsal surface surrounding the central opening was roughened by a covering of small projections. 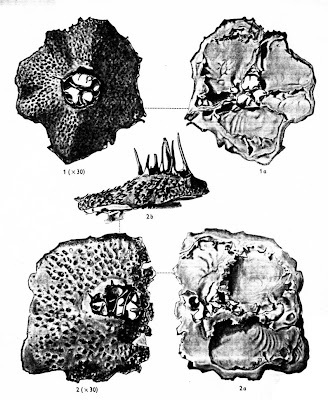 Diagram showing the internal structure of an idealised Acanthastus specimen, from Kozłowski (1949). Kozłowski interpreted Acanthastus as a colonial animal, with each fossil representing a collection of individuals (presumably one in each chamber). I'm not entirely convinced by this - except for the central cavity, each of the chambers appears to have been entirely sealed off from the outside world, nor were the chambers connected in any way that would have allowed for the ready transfer of nutrients from the outside. But then, I've never been able to understand how on earth blastoids were able to survive either. Because all the other taxa described by Kozłowski (1949) were graptolites or likely graptolite relatives, Acanthastus has always been associated with graptolites as well (for instance, appearing on a Wikipedia list of graptolite genera). However, Kozłowski himself was much less confident, noting that "Comme nous ne connaissons aucun organisme fossile ou vivant dont la morphologie ressemblerait à celle des Acanthastida il n'est pas possible de préciser actuellement leur position taxonomique" ("As we do not know any fossil or living organism whose morphology resembles that of Acanthastida it is not possible to currently define their taxonomic position"). After ruling out a relationship with coelenterates, bryozoans or tunicates, Kozłowski tentatively suggested that Acanthastus might be related to graptolites and pterobranchs by a vague similarity in skeletal structure, while admitting that its overall morphology was vastly different. 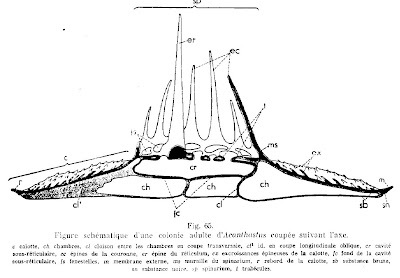 His comment about relationships between Acanthastus and graptolites was that "Le plus qu'on pourrait admettre c'est que les Acanthastida appartiennent au même embranchement que ces derniers" ("The most one could admit is that Acanthastida belong to the same embranchement [phylum?] as the latter"), hardly a ringing endorsement. Unfortunately, no further study has been conducted on Acanthastus since Kozłowski (1949). I don't know how much of Kozłowski's original material still remains (see below), nor do any further specimens seem to have been recorded. As well as being one of the most significant publications in the history of graptolite research, Kozłowski's 1949 monograph has to have one of the most dramatic publication histories. Though Kozłowski seems to have finished composing it in 1938, its publication was delayed for ten years by a small distraction known as World War II* (Kielan-Jaworowska & Urbanek, 1978). The Palaeontology department of the Warsaw University where Kozłowski worked was firebombed by the Germans in 1939 and all the material held in it destroyed. Some of Kozłowski's collection, as well as the monograph manuscript, was saved because it had been hidden in the basement of the Warsaw Seismological Observatory a few days before the destruction of the Palaeontology Department. When Kozłowski was able to return to the Observatory over a month later (German troops had been occupying it over that time), he found the place ransacked and all his material apparently lost. It wasn't until a few months later that he found his specimens and part of the manuscript among the ruins of the University, while a colleague found the remainder of the manuscript buried in a snowdrift. In 1944, hundreds of thousands of Warsaw's inhabitants, including Kozłowski, were forced to flee the city. Again, the monograph manuscript was hidden, this time in the central heating pipes of Kozłowski's house. Kozłowski returned in 1945 to find the house ruined but the manuscript still safely hidden and waiting to be published. Also surviving the war intact were the negative for the monograph's plates which had been forwarded to Paris shortly before the war's beginning. Which all kind of puts any problems you might have with reviewer delays into perspective, doesn't it? *There's a fantastic story about British television and World War II. Television broadcasting was halted in Britain after the declaration of war. Supposedly, the first broadcast after the end of the war was introduced with the words "As we were saying before we were so rudely interrupted..."
Kielan-Jaworowska, Z., & A. Urbanek. 1978. Dedication: Roman Kozłowski (1889-1977). Acta Palaeontologica Polonica 23 (4): 415-425. Could it be a weird xenophyophore? The first thing I visualized was the base plate of an anemone, with the spines going up the mesenteries. like this pic, but with the cup shape flattened out. Were there any signs of operculi? or layered theca like in graptolites? Thanks Laurent. I thought I'd come across that usage before, but I wasn't sure. Steve - there's no operculum of any sort. The theca is made up of layers which is why Kozlowski suggested graptolite affinities in the first place. His reason for excluding cnidarian affinities (basically, that Acanthastus' structure was too complicated) seems pretty weak to me, but the rough dorsal surface looks likely to be external rather than internal, and the arrangement of spines might be too irregular for a cnidarian. It's definitely not a xenophyophore - no xenophyae, for a start. But then, I've never been able to understand how on earth blastoids were able to survive either. Is there a layman-accessible introduction to blastoid morphology available anywhere online? What I've seen (eg. WP) is very vague.